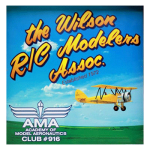 Wilson R/C Modelers Association Site. We are celebrating over 40 years of experienced flying. If you are looking to get into this hobby, please take a few minutes to check out our site. Our club involves radio controlled airplanes and helicopters. This site contains a ton of good information to help out everyone from the beginner to the advanced flyer. We have a photo gallery which includes members’ airplanes and helicopters. Here you will also find: engine tip, what to look for on your preflight of airplanes and helicopters, useful tips and tricks, troubleshooting and flight trimming charts, links, and much much more! This is your one stop on the web to hopefully find everything you are looking for. We are currently looking for a new field but our alternate field is located near Sims, NC near 10776 Simms Road, Bailey, NC 27807 (GPS Coordinates: 35°47’58.2″N 78°02’34.6″W OR 35.799486, -78.042941).